There are a lot of half-truths out there when it comes to the economy and our office tries to provide the full picture when available. For example, our work on job polarization showed that the economy was not just adding low-wage jobs, but also lots of high-wage ones as well. Another half-truth is that the unemployment rate is declining for bad reasons. Undoubtedly some of the improvement has been for bad reasons (fewer Oregonians looking for work) but it really has improved for good reasons as well (more jobs). Which brings us to the Graph of the Week and the question of whether or not job growth in the state is not only strong enough to bring down the unemployment rate but whether or not it keeps up with population growth. It turns out that even with the relative slowdown in hiring in recent months, job growth is strong enough to keep up with population growth . Today, the state needs to add approximately 1,000 jobs per month to meet population increases. Furthermore, these job gains should be putting downward pressure on the unemployment rate. After a period of strong job growth coming out of recession then comes the population and labor force response. Our office has been discussing this dynamic quite a bit over the past year. Even as jobs have returned in greater numbers, the unemployment rate is not falling due to more Oregonians looking for work. Another way to say this is that earlier in the recovery the improvement in the unemployment rate overstated the economic strength as individuals left the labor force. 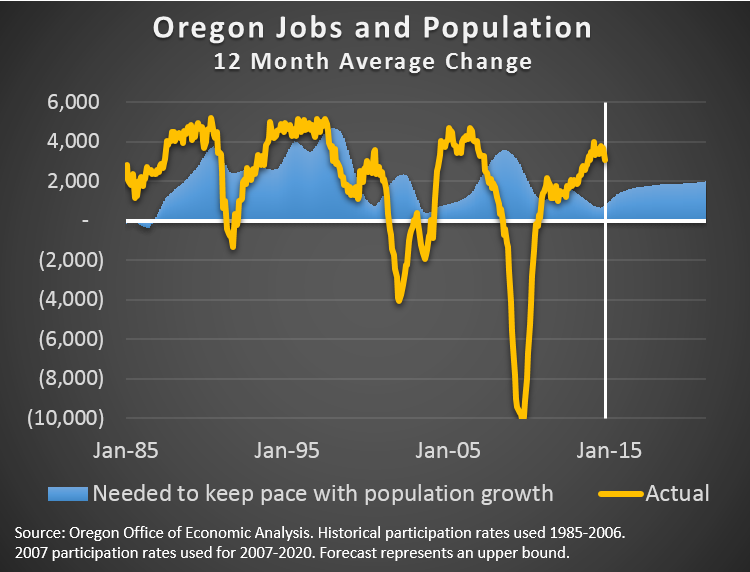 However just indicating that the unemployment rate today is unchanged for much of 2014 similarly understates the economic strength as more Oregonians are looking for work. Moving forward, there are two important factors to the outlook. The first is that our employment forecast calls for job growth to continue to outstrip population demand for the next 5-6 years. (Or until the next recession hits) This means that the progress being made on measures like the employment-population ratio for prime working age adults will continue. Much of the gains in recent years and in the near future are just trying to make up the lost ground due to the Great Recession. Secondly, the blue line in the graph does not exhibit the same surge in population/labor force in the coming years as in past expansions. For one, this is partly by design (see footnote below). Additionally, much like our overall economic and revenue forecast, our population growth outlook over the coming decade is lower than in past expansions. As the Baby Boomers age into their retirement years, this will place downward pressure on net growth rates. As such, while today Oregon needs to add about 1,000 jobs per month to keep up with population growth, by 2020 this will increase to only about 2,000 jobs per month. This is largely due to that fact that about 60% of the employment change in the coming decade is to be generational churn rather than net job creation. Given the decline in the labor force participation rate during and after the Great Recession, I actually fix the participation rates by age cohort at their 2007 levels for all years since. The exception is the 65+ cohort where rates have risen with the aging Baby Boomers. I allow for the 65+ cohort participation rates to continue to rise gradually over the next decade, following the BLS and OED labor force projections. Doing so means the numbers are not pulled down by the Oregonians dropping out of the labor force, even if they truly would like a job. (This is a common critique of the headline unemployment rate.) As such, from 2007 through the forecast period, the job gains needed to keep pace with population growth represent more of an upward bound. This means the cyclical bounce in participation and the labor force response is, by definition here, removed. I would argue this is important to due, and it shows that even if you leave to the side the issue of structural or cyclical issues in the participation rates, job growth today is more than population growth.